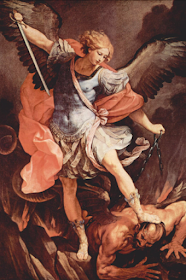 La Salette Journey: Why is it that the Saint Michael Prayer has been abandoned by so many? Catholic Blog dedicated toward Our Lady of La Salette: Reconciler of Sinners. Why is it that the Saint Michael Prayer has been abandoned by so many? "While priests abusing Catholic young was already headed upward — a path begun in the early 1950s — it exploded immediately after 1965, the year the Church, transforming itself after Vatican II, removed the Prayer to the Archangel Michael from Mass, Catholicism’s most potent shield against the enemy. ￼The prayer’s liturgical placement had been initiated with Pope Leo XIII, who sometime between 1884 and 1886 had a legendary mystical experience during which it was indicated to him that the devil would have enhanced powers to attack the Mother Church of Christianity. The practice of reciting the prayer and the other ones instituted by the holy Pope Leo after Mass was officially suppressed in 1964 — ironically, on September 26, just days before the archangel’s feast day — by an Instruction Inter oecumenici which came into effect on March 7, 1965. Removing the obligation to recite this prayer (along with the three Hail Marys, the Hail Holy Queen, and the prayer for the Church) after Low Mass did not mean forbidding its use either privately or publicly, but it was all but lost to the Church-at-large. Forms of Low Mass itself ended in 1970. The prayer is still not widely recited at Mass today, though Saint Pope John Paul II urged the faithful to keep praying it in 1994 — immediately after an upsurge in abuse reports but as such cases headed on a sharply downward trend, soon leveling off. Last October Pope Francis, in the midst of new headlines about abuse, generated by a Pennsylvania grand jury report and the scandal of Cardinal Theodore McCarrick, similarly petitioned all faithful to recite it." In 2014, I addressed this specific issue. See here. I wrote, in part, "Venerable Anne Catherine Emmerich warned that the faithful, 'must pray above all for the Church of Darkness to leave Rome..' Venerable Emmerich was a true mystic and was shown the dark forces which are constantly attempting to undermine the Church in Rome [the Magisterium] and that the ultimate goal of ecclesiastical masonry was to infiltrate the highest levels of the Church in preparation for the entrance of the Man of Sin upon the world stage. O Glorious Archangel St. Michael, Prince of the heavenly host, be our defense in the terrible warfare which we carry on against principalities and Powers, against the rulers of this world of darkness, spirits of evil. Come to the aid of man, whom God created immortal, made in his own image and likeness, and redeemed at a great price from the tyranny of the devil. Fight this day the battle of the Lord, together with the holy angels, as already thou hast fought the leader of the proud angels, Lucifer, and his apostate host, who were powerless to resist thee, nor was there place for them any longer in Heaven. That cruel, that ancient serpent, who is called the devil or Satan, who seduces the whole world, was cast into the abyss with his angels. Behold, this primeval enemy and slayer of men has taken courage. Transformed into an angel of light, he wanders about with all the multitude of wicked spirits, invading the earth in order to blot out the name of God and of his Christ, to seize upon, slay and cast into eternal perdition souls destined for the crown of eternal glory. This wicked dragon pours out, as a most impure flood, the venom of his malice on men of depraved mind and corrupt heart, the spirit of lying, of impiety, of blasphemy, and the pestilent breath of impurity, and of every vice and iniquity. These most crafty enemies have filled and inebriated with gall and bitterness the Church, the spouse of the immaculate Lamb, and have laid impious hands on her most sacred possessions. In the Holy Place itself, where has been set up the See of the most holy Peter and the Chair of Truth for the light of the world, they have raised the throne of their abominable impiety, with the iniquitous design that when the Pastor has been struck, the sheep may be scattered. Arise then, O invincible Prince, bring help against the attacks of the lost spirits to the people of God, and give them the victory. They venerate thee as their protector and Patron; in thee holy Church glories as her defense against the malicious power of hell; to thee has God entrusted the souls of men to be established in heavenly beatitude. Oh, pray to the God of peace that He may put Satan under our feet, so far conquered that he may no longer be able to hold men in captivity and harm the Church. Offer our prayers in the sight of the most High, so that they may quickly conciliate the mercies of the Lord; and beating down the dragon, the ancient serpent, who is the devil and Satan, do thou again make him captive in the abyss, that he may no longer seduce the nations. Amen. Behold the Cross of the Lord; be scattered ye hostile powers. The Lion of the tribe of Judah has conquered, the root of David. Let thy mercies be upon us, O Lord. As we have hoped in thee. O God, the Father of our Lord Jesus Christ, we call upon thy holy name, and as suppliants we implore thy clemency, that by the intercession of Mary, ever Virgin immaculate and our Mother, and of the glorious Archangel St. Michael, thou wouldst deign to help us against Satan and all other unclean spirits, who wander about the world for the injury of the human race and the ruin of souls. Are dark forces behind the neglect of this prayer? At La Salette, Melanie Calvat was told that "Rome will lose the faith and become the seat of the Antichrist. For now is the time of all times, the end of all ends. The Church will be in eclipse, the world will be in dismay...Now is the time; the abyss is opening. Here is the king of kings of darkness, here is the Beast with his subjects, calling himself the savior of the world." Pope Leo XIII, a great champion of marian spirituality and the Holy Rosary, was concerned enough about certain forces which have an "iniquitous design" to strike the Pastor [the Pope] and to scatter the sheep that he composed this beautiful prayer. Why then has it been largely abandoned in our post-conciliar Church?" At Saint Mary's Parish in Orange, Massachusetts, the Pastor, Father Shaun O'Connor, has eliminated the Saint Michael Prayer after Mass after the prayer was said after Mass for years. No explanation has ever been given. A concerted effort by the enemies of God to undermine the Faith, has been underway for decades.Removing the prayer to St. Michael at mass is but one example :( May God have mercy on Holy Mother Church.God Bless you Paul, for your ever faithful witness to the Truth. Father Shaun is a modernist wreckovator. Think about it...what's the argument AGAINST the Saint Michael Prayer? Apparently Fr. Shaun doesn't want to keep the devils away from the Church. If I were one of the Satanist infiltrators, that prayer would be the first to go along with anathema against Masonry. Born in Bitburg, Germany, Paul Melanson is a Catholic lay-philosopher and apologist whose work has appeared in many publications and websites including The Union Leader, The Wanderer, Seattle Catholic, Newsblaze, Helium, and Amazines. He has been interviewed by The National Catholic Register, the Southern Poverty Law Center and the television newsmagazine Chronicle.